The most important thing about American Football in this country is growing the game. No better way than adding new teams to the competition. One such club is looking to do that in season 2018. 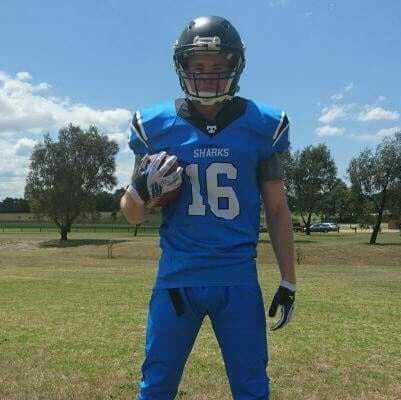 The old committee for Gridiron Victoria had stated that no new teams would enter the League until the year 2019. What does this mean for the Peninsula Sharks who were formed in 2016 after a conversation over coffee between three people reminiscing about the “Good old days”. Ultimately they would like to enter the Division 2 competition for 2018. With an incomplete application and a reluctance from the former GV committee to add another club, it’s looking more like the Sharks will be waiting another year, which is disappointing for the people involved. Fingers crossed something changes sooner rather than later. Looking back at the history of Gridiron in Victoria it shows that there has been more clubs than years the competition has been in existence, 35 clubs to be exact if you go by the GV wikipedia page. Having played myself in the JGAV (Junior Gridiron Association of Victoria) era I believe there to be another 2 or more clubs (Westside Wolfpack and Northern Knights?) that were in existence for the 2nd season of that competition. Just after the 2016 season we lost 2 clubs, one that had been around from the beginning and were a powerhouse in the 1990’s (Berwick Miners). The 2016 Division 2 Champions the Pakenham Silverbacks amalgamated themselves with the Miners, only to see player numbers dwindle dramatically and instead of a promotion to Div 1 they asked to come back to Div 2, ultimately finishing dead last with 1 win and a forfeited game. The last Div 2 side to forfeit was the Gippsland Gladiators in 2016 and they have also vanished from GV after a short existence. With the popularity growth of the sport over the past few years how does this continue to happen? Can we risk adding another club when some clubs are already struggling for player numbers? There have already been 3 clubs that resided in the Frankston/Mornington Peninsula area with the Southern Seahawks being the latest failure as recently as 2009. There are some concerns that this new club will have the same people in charge that ran the failed Seahawks and Miners. What makes President of the Peninsula Sharks, Garry Smith, think his club will be any different? Garry tried to help save an “already sinking ship” when he became President of the Miners in 2016 to help out. Garry said “The constant infighting and rogue coaching stuff lead to the fall of one of the oldest clubs in the league. By that time the damage was done and in mine and the Committee’s eyes we could not save the club from its own members. The constant threats made by text message and Facebook from life and long standing members was taking a toll and I spent more time being a mediator between arguments than looking out for the club. At that time I wouldn’t even call it a club it was more like a school yard play ground. From that point on I decided to not let this kill the love of football in my life but to rebuild that love and affection I have for this game and the tight knit family it can create”. Garry added “I know some people blame me for the down fall of the Miners, but that ship had already sailed”. On starting the Peninsula Sharks he said “In late 2016 the clubs first AGM was held and from then we hit the ground running, overcoming many obstacles and scepticism along the way which is unfortunately still present today”. I asked Garry what were the biggest hurdles he had faced “So far it has been Gridiron Victoria, with the members of the 2017 Executive Committee, but not all, making it known that we as a Club will not happen. One of those people even went as far as Facebook to voice their opinion, the comment was deleted not long after being posted”. On the subject of the previous Peninsula club he says “in 2003 the Seahawks met with GV and the next day were accepted into the league”. Considering it had been that easy back then Garry just asks “For a fair go and to let my boys play”. He continued to say “I know the rules that have been put in place and the guidelines but considering the blocking tactics by the old committee, we had no choice but to wait for the election of a new committee before we even attempted to join. Now that we are late to put in a team I do ask GV to show some compassion as they have shown other Clubs in the past and allow us to submit a team for this year’s 2018 Men’s season. Let’s help grow this sport we all love”. The Melton Wolves entered the League in 2016 as the 1st Female club. Interest in a men’s team grew quickly and before we knew it they had a team ready to go. Just 2 years into their existence the female team was disbanded for a season (low player numbers) but the men finished runner up in the 2017 Division 2 Championship game. Early signs in 2018 for the men show player numbers have almost doubled. This club is very well run and are finding ways to ease the financial pain for first time players making it more attractive. If all new clubs ran off the Melton Wolves model there would be less worrying about whether a club can survive in today’s climate. The Wolves also had the luxury of no other clubs in the surrounding suburbs, the Sharks face a less favourable scenario with rumours of the Miners returning, the new proposed Dandenong team, League powerhouse Monash, SE Predators and Pakenham Silverbacks all fighting for playing personnel. Should the League take more control at club level? Should there be zoning for clubs to eliminate the bigger clubs from getting all the talent? Questions I can’t answer and are for a completely different article. If the Sharks can’t make it into the 2018 season, I asked how they would keep the 35 players they already had signed up. “It will not be easy as the guys are keen to play but with flag starting and club functions we are looking to build on the friendship’s we have already made, it’s like a social club with fitness and the love of football. Also I have spoken with other clubs that are willing to play us in their preseason warm up”. A game against the Tasmanian state team is also planned “To get a team over there to play is a hard task but the guys are that keen they just want to play and I’ll do all I can to make that happen”. This team appears to be bonding “The guys in this team are just so focused on helping one another get better and ready for the big time. I’m not saying we will take out a Vic Bowl in the first year but I do say this, as the President/player of a club that has this much heart anything is possible”. Local council support is generally needed to get a club up and running but as Garry explains, there isn’t much support at the moment “They are not very supportive. I have communicated with them for over a year and it all comes back to the Club needing to be affiliated with Gridiron Victoria”. Sponsors have been supportive of the Sharks “We have adapted with the Clubs sponsor, The Sands Hotel in Carrum Downs, giving us full run of their side field and function room during inclement weather. We also have approval for lights to be put in at the clubs convenience so nothing will stop us there”. That’s positive news for the club moving forward. With the growth of a club will come Colts, Women’s and JV. On a Colts team Garry says “We did have the intent initially to put in a colts team but with the GV Committee and player numbers that didn’t happen for us, all things going to plan I would hope to see the colts up and ready in 2019”. On a Women’s team “Not for the next year or two I would think, we tried but the support for it was not there so I’m focusing all my time on the teams I have”. Finally on JV “Junior Varsity this year could have worked for us as we have 10 kids involved and loving it and ready to go. So it’s good to see that the building blocks for the younger members of the club coming together”. I wanted to get an insight into Garry and I asked him about his life, playing career and what he has learned so far. “What I got from being president at the Miners for the few months I was there was how not to run a club and who you should have by your side as your core network of support. I do pride myself on great leadership skills and organisation as I have run a security company as well as a number of bottle shops over the years. Dealing with recruitment, sponsors and promotions for the club is something I have done many times over the years. As a player I have played with the Southern Seahawks in 2003 till 2006 had a break not because I wanted to, but as we all know work and life can get in the way. Victorian Eagle’s State Team in 2004 and we successfully defeated a visiting American team that year. I played for the Miners in 2012, 2014, and 2016. In 2012 to 2015 the Miners had a pretty good group of guys but with new clubs coming up around them in close proximity taking players away from them started to degrade the Miners cohesiveness and started to pull the Club apart”. I’d like to personally thank Garry for his honesty, openness and time he took out of his schedule to answer my questions.